On Saturday, March 7, help Heritage Square Museum celebrate its 40th anniversary. It was on March 6, 1969, Monuments Nos 5 and 27 – the Salt Box and the Castle – were moved from on Bunker Hill to the Square (of course, they weren’t there long). The anniversary event begins at 2:00 p.m., costs ten bucks, and will feature talks by freshly re-elected City Councilman Ed Reyes and Dr Robert Winter, a long-time member of the Cultural Heritage Commission, a Heritage Square co-founder, and Los Angeles’s premiere architectural historian. Plus, I’m looking forward to the unveiling of the rebuilt veranda on HCM No. 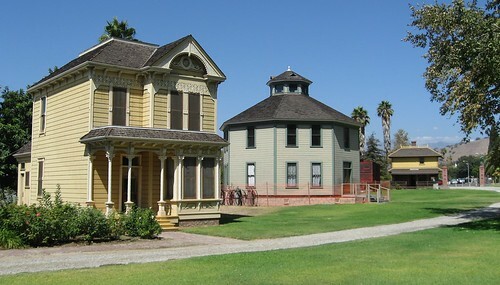 413, the Longfellow-Hastings Octagon House, pictured above between the Ford House and the Palms-Southern Pacific Railroad Depot, both city landmarks. The original veranda was removed more than ninety years ago. You can find more information at the Heritage Square blog. 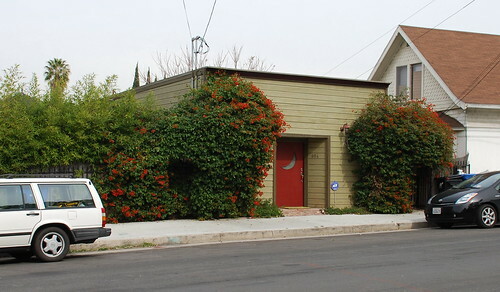 Wicks played various parts in the development of Glendale, San Dimas, Garvanza, Highland Park, Edendale, sections of downtown L.A., and San Bernardino. 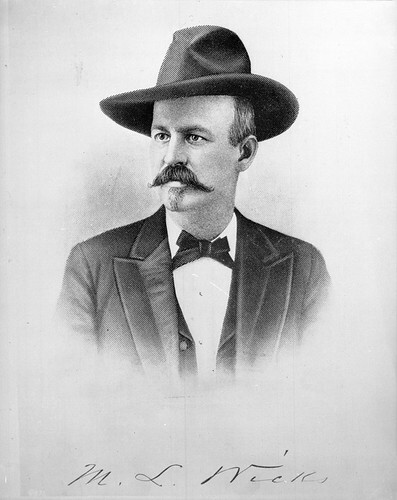 His primary platting: Eagle Rock and Linda Vista as part of Benajmin Dreyfus’s old Rancho San Rafael; the Dalton portion of the San Jose Rancho which he’d bought from Jonathan S. Slauson et al for $255,000; Pomona; and the Playa del Rey section of Rancho La Ballona. In 1884, Wicks bought land from the Southern Pacific for $2.50 an acre (cheap!) and laid out the town of Lancaster. Four years later, Wicks sold just about the whole town to James P. Ward for $46,620, or about $20 per acre. Wicks became affiliated with the Temecula Land and Water Company, and, according to author Glenn S. Dumke, he was “interested in the Savings Fund and Building Association of Los Angeles, the Los Angeles and Santa Monica Railroad, the Abstract and Title Insurance Company, and the California Bank.” Wicks put the first $50,00 into the Los Angeles County Railroad Company (of which he was first president), and sunk another $120,000 in to Ballona Harbor which he saw as a shipping point to compete with the Southern Pacific’s Santa Monica wharf. Wicks served as President of both the Citizens’ Water Company and the Sunset Boulevard Improvement Association. 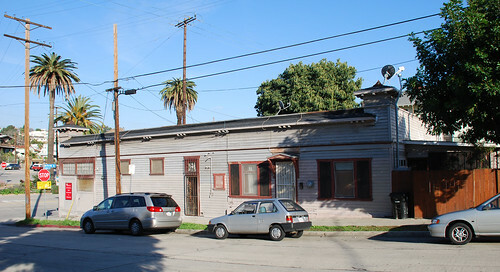 He was the “principal promoter of the Red Car Line” and tried several times to connect downtown L.A. to the coast by rail. Historic-Cultural Monument No. 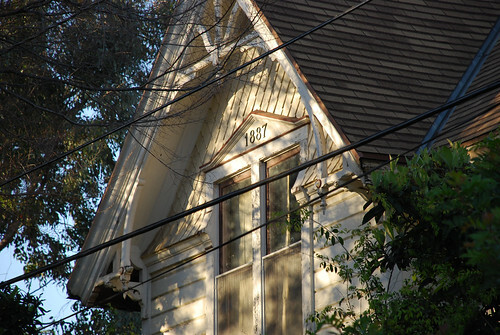 217, this 1895 house is primarily Queen Anne in design with a few hints of the Colonial Revival. Wicks lived here until about 1915. Moses Langley Wicks died in late 1919 as a result of injuries suffered after being struck by a car at Hollywood and Vine (construction engineer Louis C. Hill of 2144 Canyon Drive was behind the wheel). Poor M.L. then fell and konked his head on a steel streetcar rail, cracking his skull. 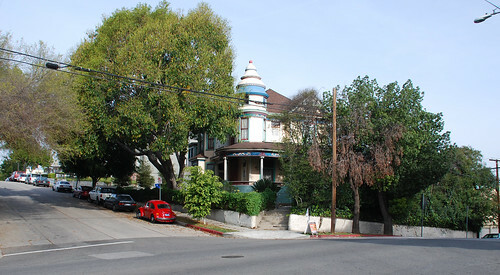 At the time, Wicks had been living at 1918 Miramar Avenue. 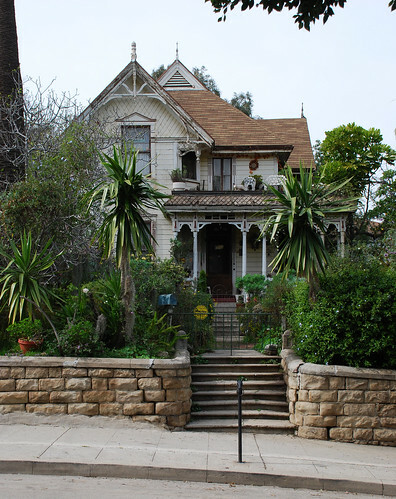 Angelino Heights – originally spelled Angeleno Heights, with an ‘e’ – was first developed by two men: William W. Stilson and Everett E. Hall. Having bought the land from Victor Beaudry and his partners (Victor Heights was right next door), the duo filed for subdivision on March 19, 1886. Stilson would be the money man while promotion would be Hall’s territory. 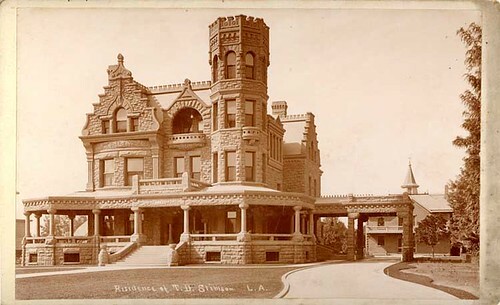 Stilson built his thirty-room mansion on the northwest corner of East Edgeware Road and Carroll Avenue. It’s still there, too, but a modernization from half a century ago has rendered the home unrecognizable. Hall and his wife, Nellie, initially moved into a place close by on Edgeware, but very soon after settled into this house on Douglas Street (then called Waters Street). 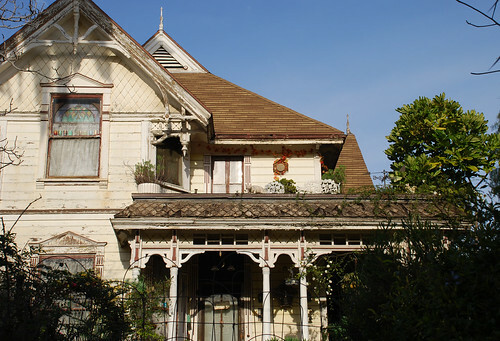 Unlike the Stilson mansion, it remains much more authentic (if in need of a paint job) and is Los Angeles Historic-Cultural Monument No. 216. Hall, from Ionia, Michigan, was an attorney and president of the Los Angeles and Pacific Railway Company. When he moved to this future landmark his estate stretched from Kellam to Edgeware. 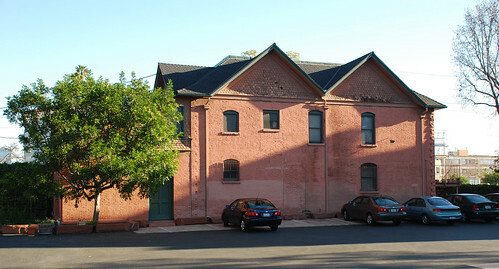 Included on the property was Hall’s carriage house. Though still in the same spot, the carriage house now belongs to 1417 Kellam Avenue around the corner. It’s HCM No. 166. From L.A.’s Department of City Planning website. 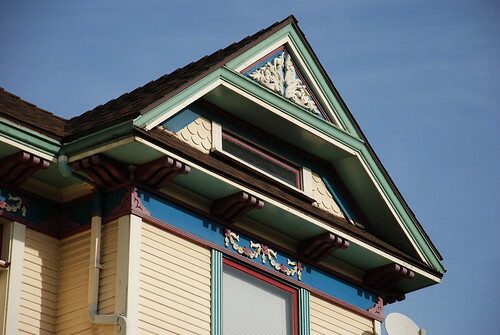 The two-story house is Eastlake in design and features an Oriental fret pattern along with its L-shaped porch. And if posting the year of construction on the side of your home were a law in L.A., it’d make things a whole lot easier for bloggers who list the year of construction on the line after the address. Hall fell on hard times shortly after moving into the house. He began selling off chunks of his property, then the home itself. 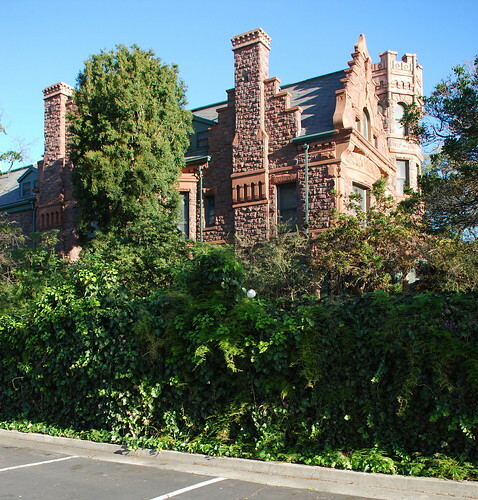 Subsequent residents of 917 Douglas included members of the Heim Brewing Company’s Heim family (another Heim, Ferdinand, owned HCM No. 77 nearby on Carroll Avenue), future Glendale bigshots Leslie C. Brand and Daniel Campbell, and Ida Millard, sister of Everett Hall and widow of Spencer Millard, Lt Governor of California (also from Ionia, Michigan). And a contemporary city directory tells us widows Amelia M. Knox and Helen Marmion were living there in 1915. Your reading this post makes me think you already know the Los Angeles Conservancy is sponsoring a self-driving tour of “five historic sites related to spiritual organizations that took root in Los Angeles in the early part of the twentieth century.” The sites are: Angelus Temple; the Self-Realization Fellowship Mother Center; Chapel of the Jesus Ethic; the Philosophical Research Society; and the Bonnie Brae House, home of the Pentecostal movement. 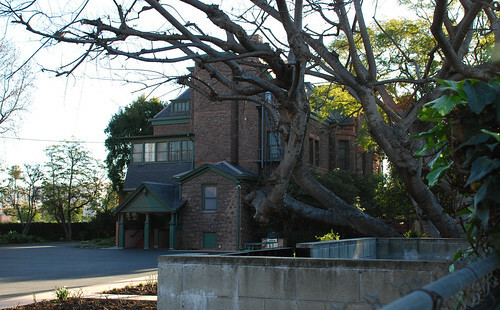 Two of the stops – the Philosophical Research Society and the Self-Realization Fellowship Mother Center (the former Mount Washington Hotel, pictured above) – are Historic-Cultural Monuments, and I’m going to take full advantage of the Conservancy tour to visit them (even though I won’t be blogging about them until, like, 2012 and 2015). I’m also planning on getting the answer to why Aimee Semple McPherson’s Angelus Temple is not a city landmark, despite being both listed on the National Register of Historic Places and one of just seven National Historic Landmarks located in L.A. 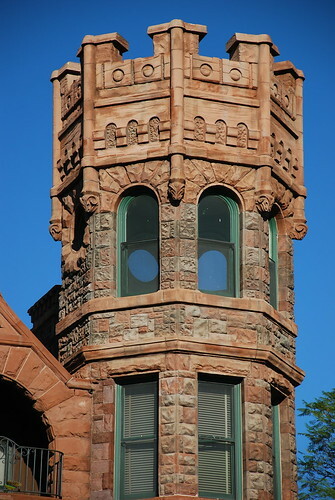 The tour is March 14, 10 a.m. to 4 p.m.
Go here for more information and tickets, please. 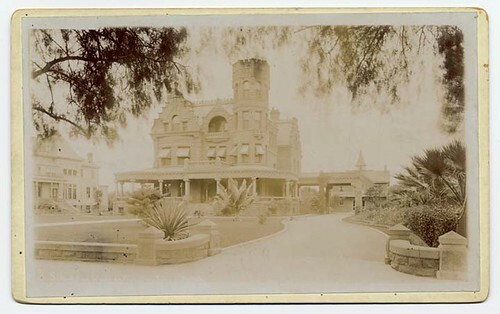 The shot of the Mount Washington Hotel is from the Los Angeles Public Library online photo archive. Okay. 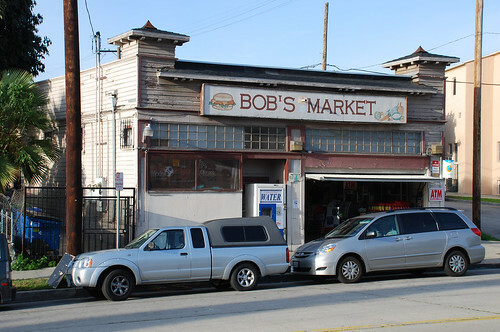 Add the proprietors of Bob’s Market to the list of those who do not appreciate my taking photos of their establishment, in this case a city landmark for nearly thirty years now. 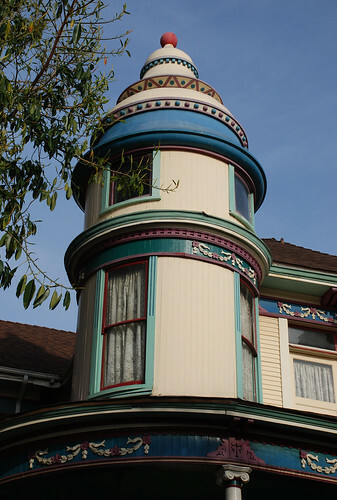 In 1913 Ella J. McMillen hired architect George F. Colterison to design for her what would be this one-story, false front, frame structure with slight Mission Revival and Oriental elements. 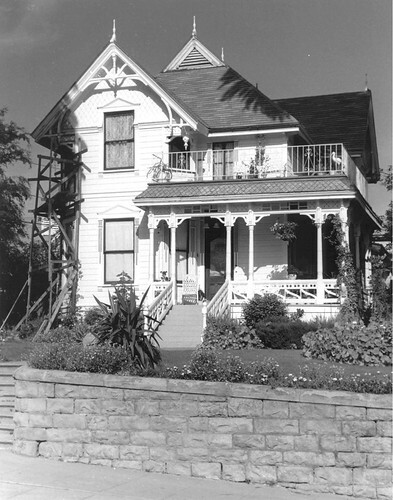 Peter A. Holmberg’s construction costs ran the Widow McMillen $3,500. The sight was absolutely perfect for a grocery store, located at a six-point intersection in the paths of trolleys, carriages, and pedestrians. 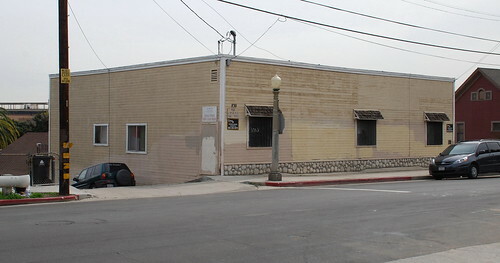 Now, at first, the building housed two businesses (and two families). 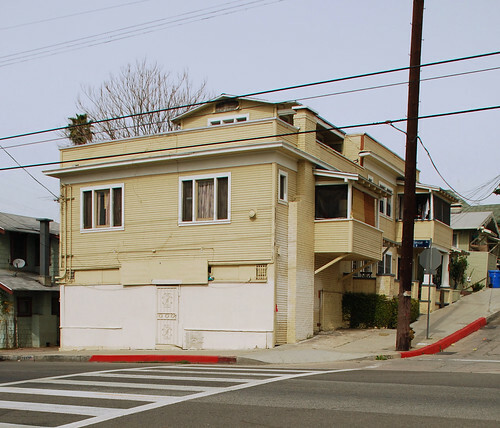 One of the first tenants/shop-owners was Levon Melkonian. He fled the Turks and the Armenian Genocide in 1914, setting up a tailor shop in the 1253 Bellevue half (his wife, Azniv M., joined him five years afterwards). Levon was on the other side of grocer Frank E. Sandberg. Abram and Miriam Kooper bought the grocery half in 1926, establishing a home there the following year. In 1934 the Koopers acquired the dry cleaning business next door from Fred and Nelly Baalberger. Since then, the building’s held a single business. Kensington Properties bought the landmark on January 11, 1963. Two years later, Bob and Keiko Nimura bought it from Ben Nakone. 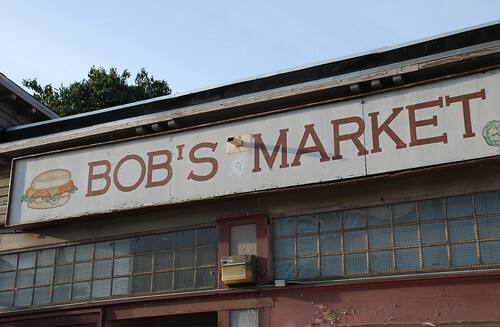 Bob’s Market narrowly escaped a devastating six-house fire on the block in August 2003. The blaze left nearly thirty residents homeless. 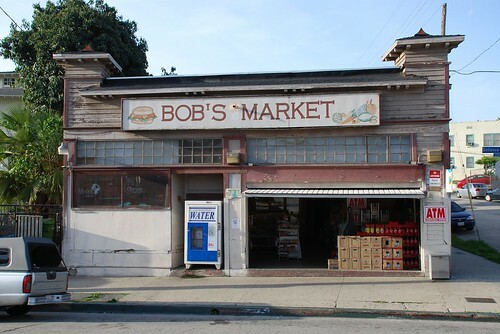 McGrew and Julian, in their Landmarks of Los Angeles, say Bob’s Market is “unique primarily because it has survived”, but what they don’t say is that Angelino Heights at one time had four local grocery stores, one of which was around till not that long ago. 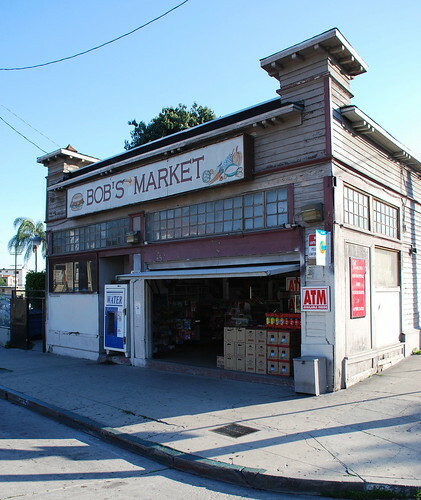 Even those of us with only a passing knowledge of Angelino Heights remember the B & K Market at the northwest corner of Bellevue and West Edgeware. You can still see the shop’s sign telling us Knudsen is The Very Best (and you can make out the B & K on the sign if you get up really close). Ninety-plus years ago, this grocery was run by a man named Henry M. Reuter. He lived right behind his shop at 1166 West Edgeware. 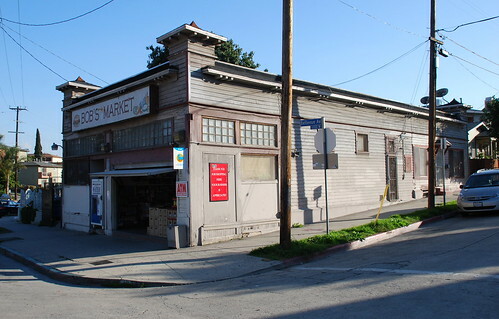 Thirdly – and most obscurely – there was Harry Smookler’s grocery at 954 East Edgeware. Harry bought the land – lot 5, block 11 – from Charlie Stimson in 1906. Smookler also lived here with his family. Poor Harry. Just a few days before Christmas 1912, the neighborhood grocer gave his son, Willie, what the Los Angeles Times called a “slight chastisement”. A sensitive lad, distraught fifteen-year-old Willie subsequently borrowed a pistol from his pal, Waldo Hardeson, who then accompanied his buddy to buy cartridges. The teenage Smookler walked to a nearby vacant lot, stuck the gun in his mouth, and committed suicide. Harry the grocer found the body. Construction began in the late spring of 1934 on this two-story, late Spanish Colonial Revival school building, designed by Merl Lee Barker and G. Lawrence Ott for the Missionary Society of Our Lady of Mount Carmel of the Carmelite Order of New York. It’s been gone going on nearly thirty years now, so if there are any Mt Carmel graduates out there, it’d be great to hear from you. 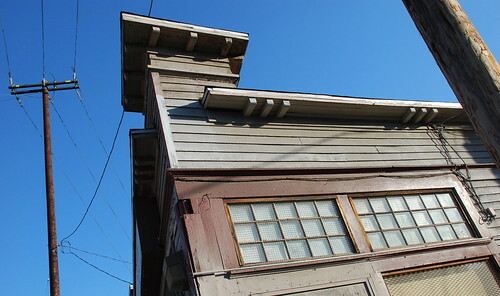 The thirty-four room structure, constructed of reinforced concrete, was the first school in Los Angeles built to new seismic standards following the 1933 Long Beach earthquake. Laurence J. Waller was the structural engineer, W.W. Petley got the general contracting gig, and the F.D. Reed Company handled the plumbing. The school’s size was 13,920 square feet, and it sported a stucco exterior. The $85,000 to $100,000 building was dedicated on January 6, 1935. Rt Rev. John J. Cantwell, bishop of the Diocese of Los Angeles and San Diego, laid the cornerstone and gave the dedicatory address. Father Flannagan gets credited with the school’s founding. The Reverend Niles J. Gillen announced in April 1976 the all-boys school, operated by the Catholic Fathers of the Order of Mt Carmel, would close due to decreasing enrollment, down to 276 from more than 600 in the early 1960s. A group of parents organized a petition drive to convince the Chicago-based Carmelites to change their minds but to no avail. Plans even called for asking Pope Paul VI to intervene. And hopes the L.A. Archdiocese would take over the school never panned out. Mt Carmel shut down with the end of the school year on May 26. 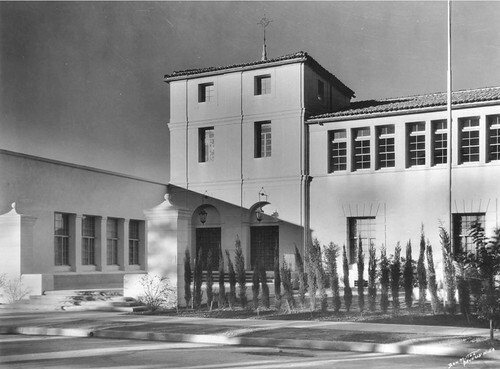 As part of its Historic-Cultural landmarking, South Central’s Mt Carmel High School was called by the city, “an excellent example of Mission architecture housing a school which has made a significant contribution to the community.” It looks like the 1979 monumental status was conferred primarily to ward off the school’s destruction by the Parks and Recreation Department which had owned the building by that time. I’ll admit I’m more than a bit sketchy about how the landmark eventually met its demise. The gym remained until a fire brought it down in 1983. By this time, though, the school building had already been demolished, maybe the previous year? Perhaps it had served as a senior center in its post-school years? 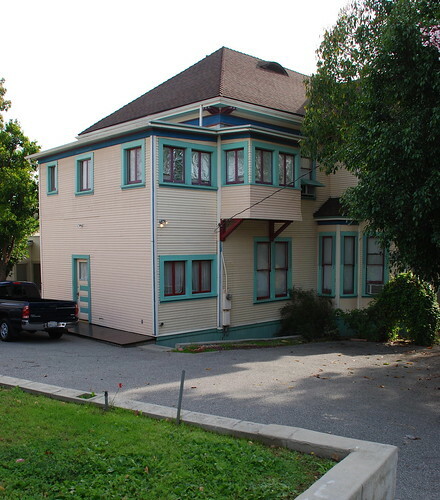 In any event, the city’s Office of Historic Resources has no record of any demolition permit being issued. If you know anything, fill us in, please. The sole picture is from the L.A. Department of City Panning’s website. Talk about great timing. I missed visiting Monument No. 213, the S.S. Catalina, by this much. The bags were packed, the tank was full, the passport – eh, let’s face it. There’s not a chance in hell I would’ve made the 180-mile trip down to Ensenada to see and be saddened over what was left of the eighty-five-year-old “Great White Steamship”. Unfortunately, I (and you) will never get the chance now. 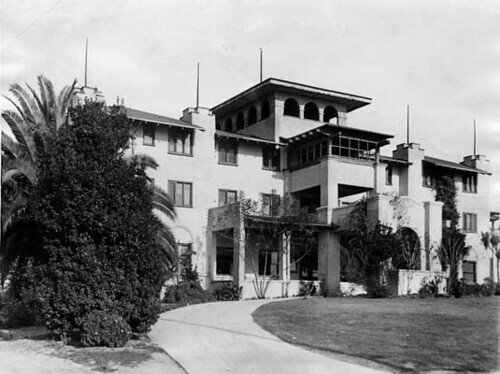 In 1919, five years after Doublemint’s debut, Cub-and-gum man William Wrigley Jr purchased Santa Catalina Island and the Wilmington Transportation Company from William, J.B., and Hancock Banning, sons of Phineas. To turn Catalina into the resort he envisioned, Wrigley needed a bunch of boats to ferry passengers between the mainland and the island’s city of Avalon. He had already gotten a pair of ships as part of the Wilmington Transportation Company – the Hermosa (1902) and the Cabrillo (1904). And, after World War I, Wrigley purchased from the U.S. Navy the U.S.S. Blueridge, built by the Globe Ironworks of Cleveland in 1891 and originally christened the Virginia. After a major refurbishment, this last ship was renamed the S.S. Avalon in 1920. But Wrigley wanted a fourth. Here are pictures of the Cabrillo (courtesy of USC’s Digital Archive) and the Avalon (from the L.A. Public Library). Like the Catalina, both ships served in World War II, the Avalon staying in SoCal, the Cabrillo eventually making its way to Sacramento. The latter was left to rot and be cut for scrap near Napa. 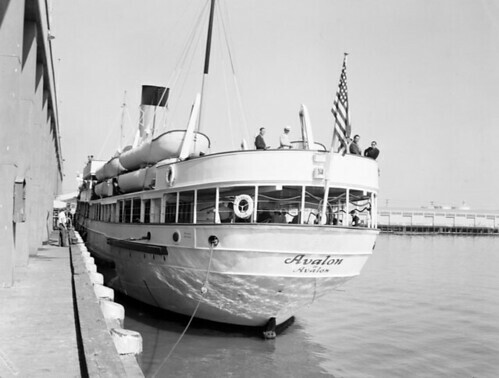 The Avalon was retired in February 1951. Nine years later, this ship, too, was cut for scrap, then suffered a fire, ultimately sinking off Palos Verdes in 1964. William Wrigley Jr laid the keel of the million dollar S.S. Catalina at the L.A. Shipbuilding and Drydock Harbor on the day after Christmas, 1923. 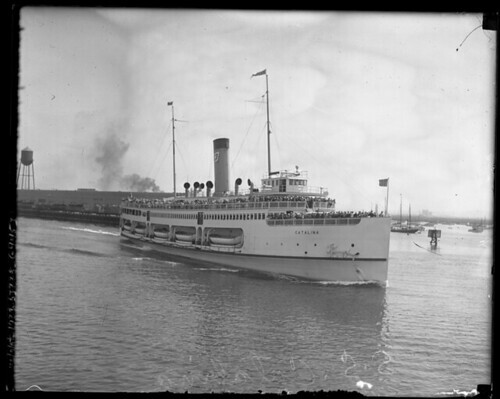 Just four and a half months later, on May 3, 1924, Mayor Cryer and 3,000 onlookers watched Miss Marcia Patrick, the sister of the Wilmington Steamship Company’s president, christen the ship. With A.A. Morris its captain, the Catalina left her Berth 185 homeport in Wilmington on June 30. The S.S. Catalina stretched 301 feet long and fifty-two-feet wide. It weighed 1,766 tons. There were five decks, three of which were for passengers: the Promenade; the Saloon; and the Main. The top deck held the bridge with the pilot house and captain’s cabin. William Wrigley, Jr, died in 1932 and his son, Philip, inherited the company. During World War II, the government drafted the S.S. Catalina into service, designating the ship as FS-99 for use as an Army Troop Transport. 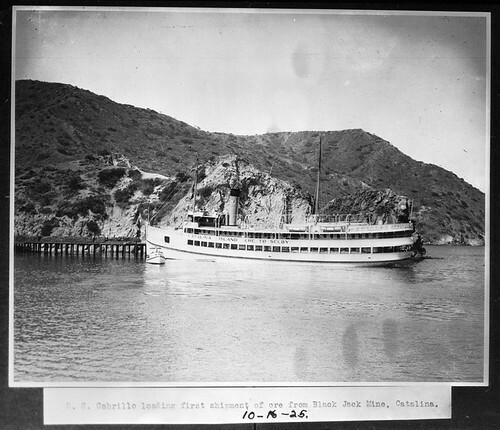 Employed in San Francisco Bay, the steamship wound up ferrying soldiers to larger warships. In her forty-four months of military service, the Catalina transported some 820,000 men, more than any other U.S. Army Transport. 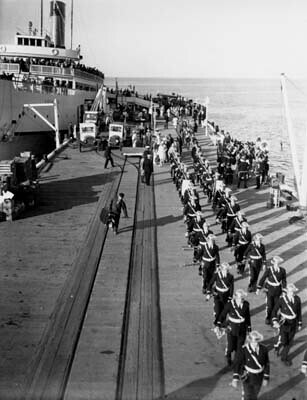 The ship was back to its old L.A. to Santa Catalina run on July 3, 1946. 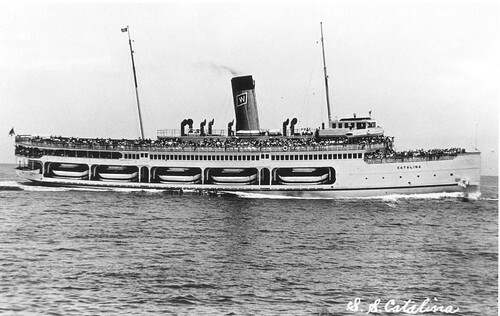 At the beginning of 1948, the Wilmington Transportation Company changed its name to the Catalina Island Steamship Line. During the 1950s, there were now just single daily roundtrips made from Wilmington to Santa Catalina. In 1956 it would cost you around $6.00 for a roundtrip ticket. The Wrigleys sold the steamship line to Charles Stillwell and his M.G.R.S. Company, Inc., in 1960. Stillwell sold the Catalina – now with its terminal under the Vincent Thomas Bridge – in 1970 to Carolyn Stanalan and her family. 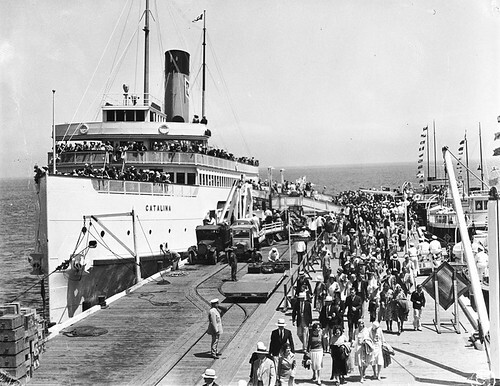 The S.S. Catalina completed her 9,807th and final crossing on September 14, 1975. Real estate developer Hymie Singer bought the ship for $70,000 at auction on February 16, 1977, as a belated Valentine’s Day gift for his wife, Ruth. The new owners struggled with docking fees, mooring the former ferry in San Pedro, Newport Beach, San Diego, and Santa Monica Bay, then settling the vessel off Long Beach for five years. An attempt at rehabilitation failed in 1983. Two years later, after the ship broke free of its moorings in a second instance – this time nearly causing a major accident, the Coast Guard had had enough and announced it was going to seize the Catalina. The owners opted to remove the ship from U.S. waters, and by the spring of 1985, the boat was three miles off the coast of Ensenada, Mexico. The Catalina Bar and Grill Restaurant opened on board the L.A. landmark in the summer of 1988, but didn’t stay in business long. Over the next two decades, the S.S. Catalina, “the Great White Steamship”, slowly deteriorated, rotting, sinking, and listing, thanks to looters and thieves, the Mexican government (which had ordered the boat’s solid bronze propellers removed, allowing seawater to seep into the ship), neglect, and plain old ravages of time. Spare half a minute and watch this video of the Catalina in Ensenada, by this time a home for sea lions. The Singers gave up ownership of the Catalina and, in 2000, the Mexican government donated the boat to the S.S. Catalina Preservation Association for non-commercial preservation purposes. Despite salvation efforts from a variety of concerned groups including the Raising the Catalina Association and the S.S. Catalina Steamship Fund, the Mexican government began cutting apart the ship for scrap just a few weeks ago. It’s figured the S.S. Catalina alone carried 25 million people in its service of fifty-one years, maybe more than any other ocean-going ship in history. Besides being designated a city landmark in 1979, the ship was also listed on the National Register of Historic Places and declared a California State Landmark. A very big thanks to Shawn J. Drake for his online essay, “The S.S. Catalina: the First 75 Years of a “Great White Steamer””. The shot at the top of the post is from the L.A. Department of City Planning, while the one below is from UCLA Library’s Digital Collection. Historic-Cultural Monument No. 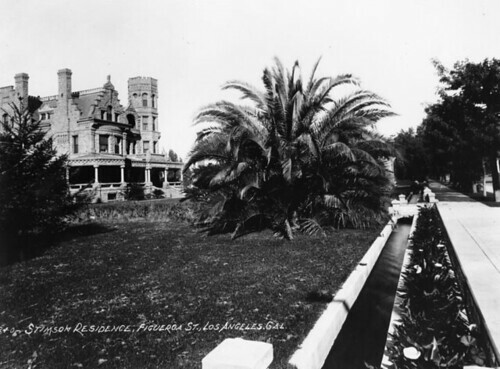 212 is the sole remaining mansion on what was, a hundred years ago, a long stretch of stately homes known as “Millionaire Row” on South Figueroa Street. If there could be only one left standing, though, I reckon it should be this one, a home the Los Angeles Times once called “the costliest and most beautiful private residence in Los Angeles.” The city says it’s the only example of Richardsonian Romanesque architecture remaining in Los Angeles. Thomas Douglas Stimson was born in French Mills, Canada. He left his childhood home in New York at the age of fourteen, later working as a trader in a Muskegon, Michigan, lumber camp. He went on to further his fortune in Chicago before retiring to Our Fair City in 1890. 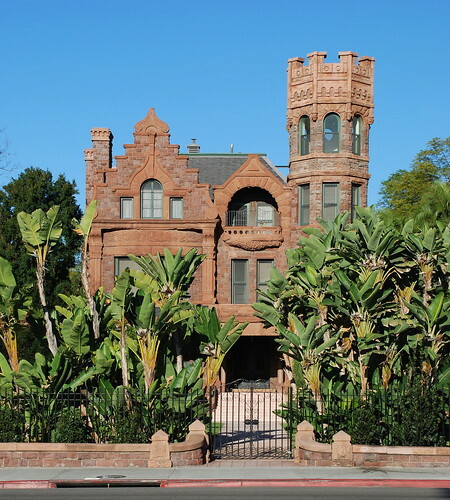 Here he quickly set to hiring to design this three-and-a-half-story, thirty-room mansion on the eastern edge of West Adams a young architect by the name of Carroll H. Brown. Brown was born in Illinois in 1863. 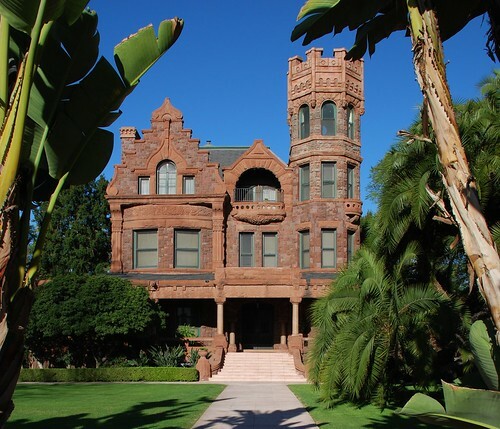 By the time he worked on the Stimson Residence, although he was only twenty-seven-years-old, he was already a prominent SoCal architect, having designed downtown mansions for Louis Shiveley, H.L. MacNeil, and W.A. Clark. He also created a $7,000 monument in Wilmington for Gen. Phineas Banning. 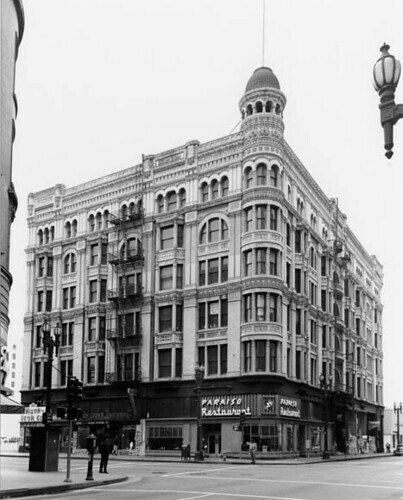 Within the next few years, the architect would go on to build the first home for the California Club, Santa Monica’s Keller Block building on Broadway, and T.D.’s six-story Stimson Block at 3rd and Spring, the largest office building in L.A. at the time (demolished in 1963). He was a charter member of the Architectural Association of Southern California, formed in 1892 and which became the Southern California Chapter of the AIA two years later. Brown became its president in 1907. He died in L.A. in 1920. 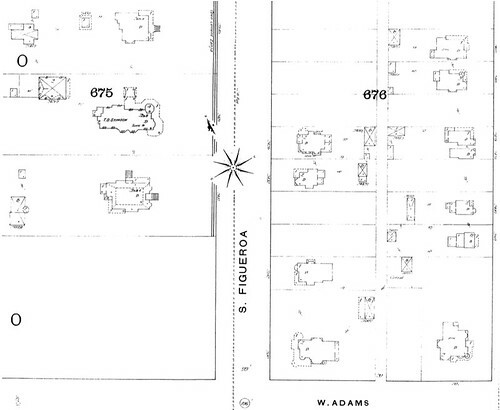 I know I’ve been including lots of Sanborn fire insurance maps lately, but here’s one more from 1894. Check out the “open cement zanja” running through Stimson’s front yard. And I don’t know when the city removed that big star lying in the middle of the street, but I’m glad they did. 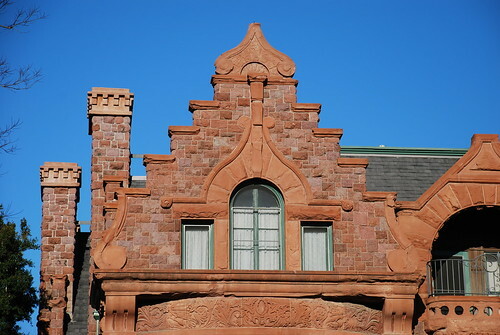 Stimson’s new 12,800 square-foot home (the square footage not including the crenellated tower) covered in red Arizona sandstone cost him anywhere from $130,000 to $200,000, as I’ve seen it pegged at a few different prices (I’d think it were more toward 130 g’s; while that was still a lot of money in those days, 200 grand was a lot of lot of money). This new home of the former lumberman consisted of room after room paneled in an incredible variety of woods, including ash, walnut, sycamore, birch, gumwood, mahogany, oak, and something called monkeypod. I’m including the following three vintage shots, each for a different reason. The top photo, from the CA State Library, is the earliest of the landmark I could find. It shows the northern side of the building, a view obscured today. The next, from the same source, is from around 1895. 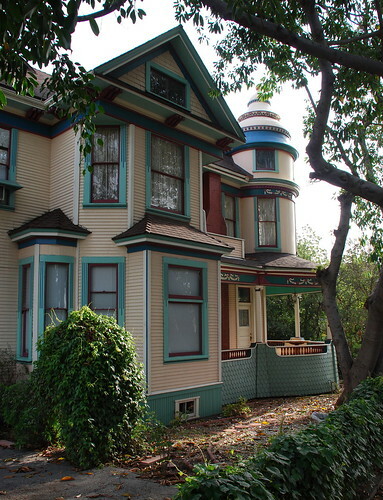 What’s extra cool about this one is it shows a glimpse of L.A. City Councilmember Frank Sabichi’s home next door. 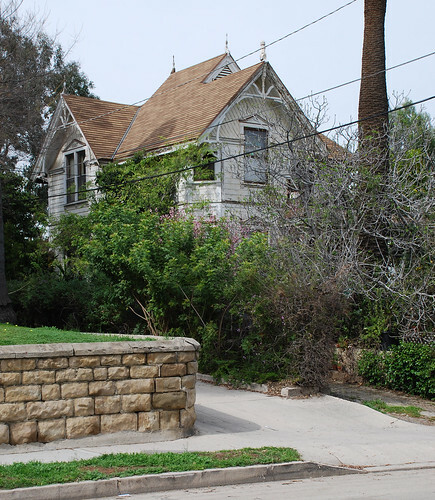 Frank’s house, like the rest of the mansions along South Fig, is long gone, today the parking lot for St Vincent de Paul’s. 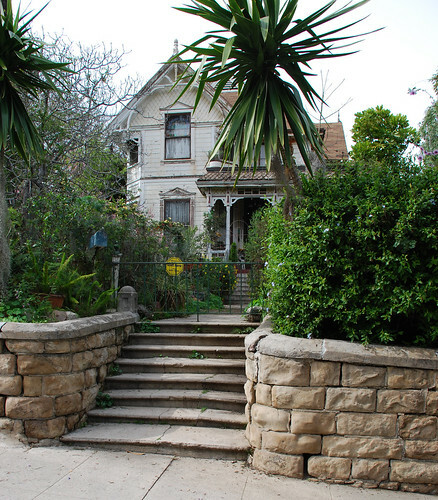 Finally, there’s a later picture of the Stimson Residence. This one, from the L.A. Public Library, shows off that zanja running along the front of the property. A month later, private detective Harry L. Coyne was arrested for the crime. The reasoning behind the deed seems the stuff of the better Columbo episodes. Coyne, having escorted Stimson’s son to Mexico City, told T.D he had uncovered a plot against the retired lumberman/financier. Following the dynamiting, Coyne offered to give information regarding the crime to Stimson, but for a price. After offering to police to implicate three men in the crime for sixty dollars, Coyne went back to Stimson and demanded $250. Ultimately, though, Coyne’s knowledge of the crime’s details did him in. He was sentenced to five years in Folsom. T.D. Stimson died in the house on January 31, 1898, at the age of seventy (“the smoothest pickpocket in the city”, “Mother” McGarey, attended the funeral to practice her vocation, but was thwarted by mourner Police Chief Glass). 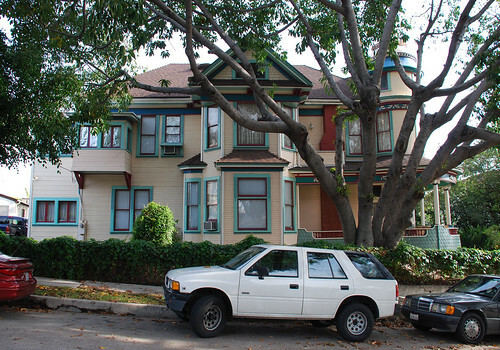 Stimson’s family remained in the house until 1907 (or maybe 1904) when they sold it to civil engineer Albert Solano. 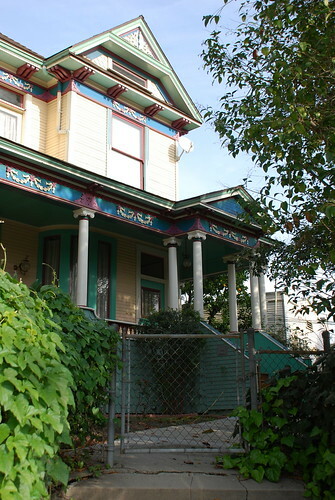 Edward Maier, the owner of both the Maier Brewing Company and Hap Hogan’s Vernon/Venice Tigers of the Pacific Coast League, bought the home in 1918, hosting parties with guests including the likes of Jack Dempsey, Barney Oldfield, and Burbank’s Boilermaker, Jim Jeffries. 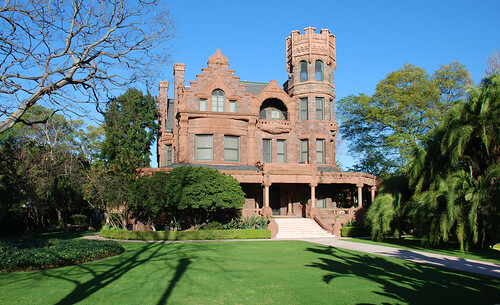 In 1940, USC’s Pi Kappa Alpha fraternity bought the former Stimson estate for a cool $20,000, mere pocket change today. Eight years later, Mrs Edward Doheny, who had been living behind the building and was fed up with the frat-house racket, purchased the house for $70,000. She then bequeathed the home to the Sisters of St Joseph of Carondelet, an order part of the Roman Catholic Church (while the congregation’s origins go back to 17th-Century France, the Carondelet part comes from a town in Missouri). The Sisters used the home as a convent until 1969. 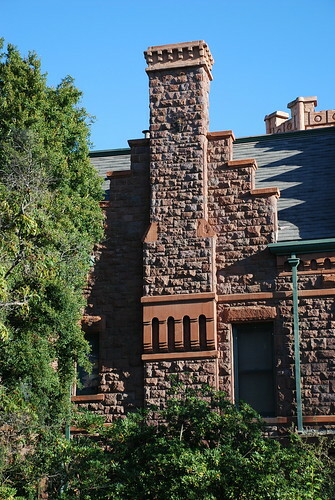 For the next twenty years, the nuns allowed Mount St Mary’s College on Chester Place to use the house as a student residence. 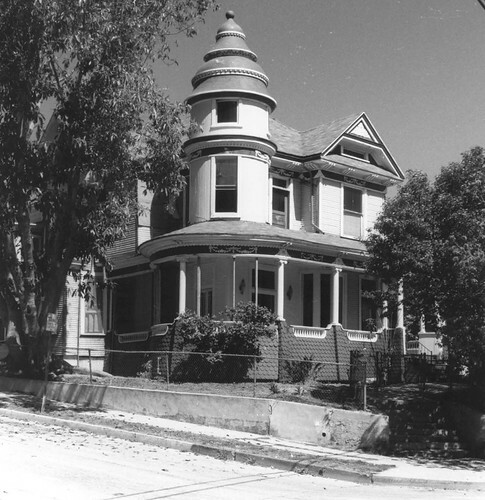 After returning to use as a convent, the home required a million-dollar restoration in the mid-90s due to damage sustained in the Northridge earthquake. You can see the landmark pop up in movies and TV shows now and then, including as the funeral home in Pushing Daisies. 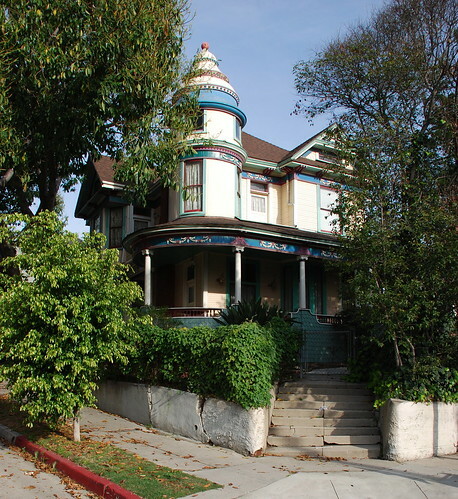 I always wondered why the Stimson Residence wasn’t one of the first sites landmarked by the Cultural Heritage Board back in the sixties. Turns out it wasn’t for lack of trying. The first attempt at declaring the home an HCM happened in March 1965. The archdiocese resisted monument status to such an extent that it wasn’t until 1975 when the issue was again raised. Again, the archdiocese resisted, citing the designation would produce “undue restrictions on… [the] use and enjoyment of the property.” However, thanks mainly to a guy named Richard Mouck who really lobbied for dedication, the house of Stimson was officially landmarked in May 1979, a year after it was listed on the National Register of Historic Places. 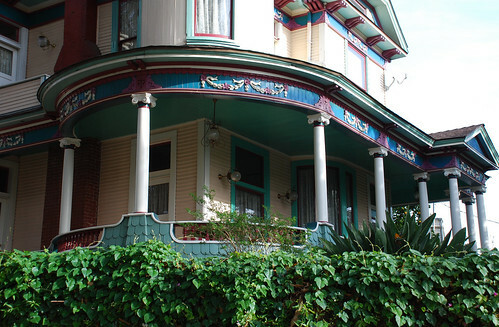 Finally, please see Don Sloper’s Los Angeles’s Chester Place for a bunch of interior photographs (and of this section of West Adams in general).